This is the second book in the Gentleman Bastards series (and the second Scott Lynch book) that I have read. What a Prologue! It made me want to give up my job so that I could dedicate every waking minute to reading this book to find out what happened! That’s how good it was. I so wanted to find out whether the scene in the prologue was part of one of their hare-brained schemes or whether something had gone so badly wrong to affect Locke and Jean’s friendship so dramatically. The first paragraph of the prologue featured in my first First Chapter - First Paragraph - Tuesday Intro post, so be sure to check it out. And it wasn't just the prologue. I thought the quarter half of the book started much stronger than the first book and was full of action. I found myself immersed in the world much quicker and it was great to be reacquainted with Locke and Jean. We also had a brief appearance of Chains in one of the “Reminiscence” chapters. These reminiscences in the last book confused me to start off with but then I really grew to like them as it helped build the story and the characters so it was good to see that Lynch was consistent and brought these chapters through in to this book, at least for the first third of the book. And one of my favourite scenes from the first book was included in one of these reminiscences again which was great (Locke as a child travelling on the back of a Gentled goat to see Barsavi with an almighty hangover). In this book we see how Locke and Jean cope with losing their comrades in arms and set their sights on a new “project” in Tal Verrar. They find themselves in the thick of it, not just in their own long con at The Sunspire Gaming Hall (which makes me think of this book like a Fantasy version of Ocean's Eleven) but also the Bondsmagi catch up with them and they are drawn in to a game which is not of their own making by the Archon of Tal Verrar. They are sent to Sea against their wishes but with very little options given the fact they have been poisoned and must do as they are told in order to keep up a supply of the antidote. Is everyone manipulative bastards on the take in this world? Seems that way! So, new city, new characters and new scrapes for Locke and Jean to get themselves into (and out of). 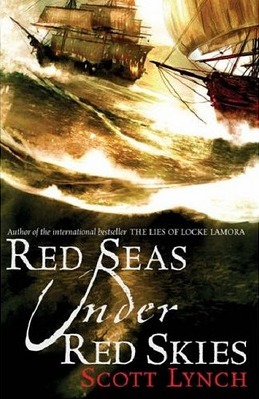 Half of the book is set on dry land while the latter half is set at sea with a good dose of pirate shenanigans. Another great book to the series. For those of you who loved the first book, you’ll love this one even more and for those who thought the first one was just ok, I’d say give this one a go as I personally thought this was the better book of the two.